A long weekend looms, but before that, there’s a lot to digest. Perhaps topping the list is the latest scuttlebutt around trade with China (see more below). Netflix earnings also rank high, with shares down 3% in pre-market trading after a Q4 revenue miss. Automaker Tesla is also in the news after announcing plans to shrink its workforce as it tries to lower product prices and improve its margins. Amid optimism over China, markets in Europe and Asia all rose more than 1% early Friday, one of those few times when every index is in sync. U.S. stocks also had a positive tone before the opening bell, but whether that can last is a big question. Whichever way the market is going heading into the last hour today, it might be interesting to see if it reverses course if people flatten out their positions in a possible attempt to lessen up on risk ahead of the weekend. Then we’ll have to watch and see what kind of news comes out over the next three days, especially on the China front. U.S. markets are closed Monday for the Dr. Martin Luther King, Jr. birthday holiday, and Market Update won’t publish that day. China News Lifts Hopes, But Will It Last? If investors needed any more evidence of how closely the market is tracking U.S./China negotiations, they arguably got it Thursday. Major indices woke up from a lethargic morning after The Wall Street Journal reported that Treasury Secretary Steven Mnuchin proposed lifting some or all tariffs to advance trade talks and win China’s support for longer-term reforms. This is far from a done deal, and investors should consider taking it for what it is—likely a trial balloon that could face resistance from harder-line U.S. negotiators. The other thing to consider is that China news can work both ways. There continues to be a lot of rumor and innuendo, and on any given day either positive or negative tidings on the situation could lift or trip up the markets. Remember, as recently as Thursday morning, moods were sullen as China’s government referred to proposed U.S. legislation against Chinese firms Huawei and ZTE as “hysteria.” At the same time, there was a report that the U.S. was considering new auto tariffs. In other words, things can change on a dime. That’s one reason volatility remains high, though the Cboe Volatility Index—the market’s main fear indicator, retreated down to near 18 on Thursday from above 30 in the days after Christmas. With so much rumor in the air not only about China but also on the government shutdown and Brexit, caution could be the watchword going into the U.S. three-day holiday weekend. As we noted yesterday, recent Fridays have brought some profit taking, especially in weeks where the market has already booked some gains. This trend actually has a name: the “Friday effect.” If things do remain steady toward the last hour today, the takeaway would probably be bullish. That’s because it could solidify thoughts that people are getting more comfortable with risk after months of “risk-off” trading. Some risk-on sentiment appeared to show up late this week as 10-year Treasury note yields climbed to 2.75% by the end of the day Thursday, closing in on three-week highs posted earlier this week. Some of the more cyclical sectors drew investor interest Thursday, as well, with the sector leaderboard dominated by industrials, materials, and energy. The possibly softer tone in trade negotiations reported by The Wall Street Journal appeared to help those sectors, with some of the bellwether stocks like Caterpillar and Boeing getting a lift. Some analysts call these the canaries in the coal mine for optimism or pessimism about China tariffs. Most of the FAANGs, on the other hand, only posted small gains Thursday as investors awaited earnings from Netflix after the close. When the news did come, the Netflix movie appeared to have a bittersweet ending. Yes, streaming subscriber numbers rose more than expected, climbing by 11.36 million in Q4, and the company’s Q4 earnings per share beat third-party consensus estimates. However, revenue just missed analysts’ expectations. Also, Netflix also continues to spend a lot of money, though it promised its cash burn would peak this year and then go down. Comcast and Disney also have streaming options, so competition is heating up. In a conference call with analysts, Netflix executives said the company’s spending reflects its move toward more “owned” content and production. Netflix expects 8.9 million global subscribers in Q1, above a pre-earnings third-party consensus of 8.2 million. That growth, it said, is due to the success of original productions like Bird Box. In one sense, the spending isn’t necessarily a bad thing. If Netflix continues to put its money into successful original productions, it’s arguable that the costs ultimately could pay off in more subscribers. Still, it seems like maybe Netflix has had such an incredible run in the market recently that a lot of the news is already out. The company released viewership numbers a while ago, so what else can it say? It may have run out of bullets on how to excite people, at least for now. High-end retailer Tiffany is also in the news as it reported holiday results. The company guided toward the low end of its previously-disclosed earnings per share range, and comparable year-over-year sales fell 2% during the holiday season. Much of the company’s sales are related to tourism, so the spat between China and the U.S. might be a pressure point. However, shares bounced back in pre-market trading after being down earlier. Earlier this week, it was like old times as the financial sector helped lead the rally. On Thursday, it looked more like a rerun of 2018, with financials climbing about 0.5% but well down on the sector leaderboard. This came after Morgan Stanley’s (MS) disappointing earnings, though MS shares did claw back a little after dropping sharply early on. Most of the big banks suffered in Q4 from a tough trading environment, and MS arguably had the worst time. However, the entire sector still faces a potential challenge. If interest rates remain flat, that means they don’t have the spread revenue coming in, conceivably making them more reliant on trading. The financial sector is having a decent start to 2019, but we’re still only a couple weeks in and the interest rate environment doesn’t look particularly favorable, at least not if you’re a bank trying to boost margins. On the data watch today, University of Michigan Consumer Sentiment is arguably the biggest piece of economic news. Holiday shopping season, which originally had looked pretty impressive, now has some questions surrounding it after Macy’s and Nordstrom reported disappointing sales. The confidence number might help investors glean whether any retail blues might have stemmed from falling sentiment. Figure 1: 50 And Up: For the first time in about a month, the S&P 500 Index (candlestick) caught up with its 50-day moving average (blue line). This six-month chart shows that it’s been rare for the SPX to be above its 50-day moving average over the last few months, so it might be interesting to see if it can sustain this position. Data Source: S&P Dow Jones Indices. Chart source: The thinkorswim® platform from TD Ameritrade. For illustrative purposes only. Past performance does not guarantee future results.DATA SOURCE: S&P DOW JONES INDICES. CHART SOURCE: THE THINKORSWIM® PLATFORM FROM TD AMERITRADE. Pony Up: With Ford earnings due next Wednesday, maybe it’s a good time to check in on one of the company’s flagships, the iconic Ford Mustang. This April marks the 55th anniversary of the car’s 1964 introduction, and it coincides with F planning to stop production of almost all small- and mid-size cars in the U.S., except for the Mustang. More than 10 million Ford “pony cars” have gone out the door since its debut, but not all is smooth revving in the corral. Mustang sales fell more than 7% in 2018, and are down nearly 40% from 2015, according to auto industry data. One issue is that Mustang sales historically pop when a new model comes out, and F hasn’t introduced a completely new Mustang in four years. Unfortunately for F, a new Mustang appears to be about two years out, automotive media outlets report. The Mustang was the best-selling sports coupe in the world last year, with more than 75,000 rolling out to U.S. customers and thousands more selling abroad. The company also might have a 700-horsepower Mustang in the works that could top 200 miles per hour, Road & Track reported. Paint Splatters: It’s no secret that the U.S. housing market has been under pressure lately, but the weaker than expected preliminary Q4 results this week from paint maker Sherwin-Williams probably helped send additional shivers through some of the home builder and home improvement companies. In a side note, home construction company PulteGroup received a downgrade Thursday and shares fell, reflecting in part the slowing housing environment as homes grow more expensive. Often when home construction companies suffer, that helps pick up some of the home renovation companies like Lowe’s and Home Depot, the thought being that if people can’t afford a new home, maybe they’ll do a new kitchen or bathroom. However, painting comes with any home project, so it might make some market participants nervous to see Sherwin-Williams’ business hurting. Lowes and Home Depot report later this earnings season, but consider staying tuned for their insights now that Sherwin-Williams has raised concerns about perhaps more weakness in housing. Technical Picture: Thursday’s late rally pushed the S&P 500 Index above its 50-day moving average of 2626. 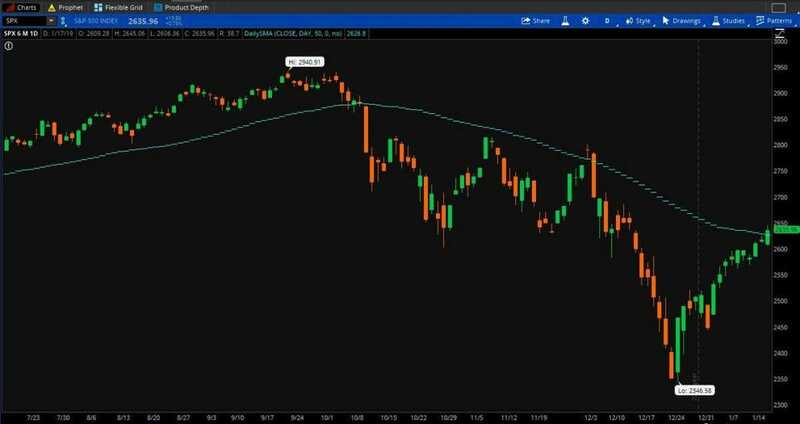 This week marks the first time in about a month that the S&P 500 has flirted or surpassed a major moving average, and that could potentially help the market from a chart perspective. On another note, the S&P 500 is approaching what technical traders call a “50% retracement” of the gap between its Q4 closing low and its 2018 closing high. The level to consider watching is around 2640, which would mean a 50% comeback from Dec. 24 when the market most recently bottomed. A close above 2640 might signal to some traders that the rally has more legs, and could mean some investors putting money back to work in the market. However, we’ll have to wait and see. Things have come pretty far, pretty fast, and there’s also the risk of profit-taking ahead of the long weekend.